The aim of the package is to make it simpler for people to get into writing games for RISC OS, using BBC BASIC. As such, the central core of the kit is a library of BASIC functions that cover sprite plotting, error handling, screen transitions, MP3 playback, and much more. There is also a ’tile’ library, proving a general game engine for tile-based games, and another covering sound – and sound support also benefits from the inclusion of AMCOG’s virtual sound chip, RDSP. And as well as the BASIC program libraries, also included are a number of resources – game sprites, music tracks, and sound samples. 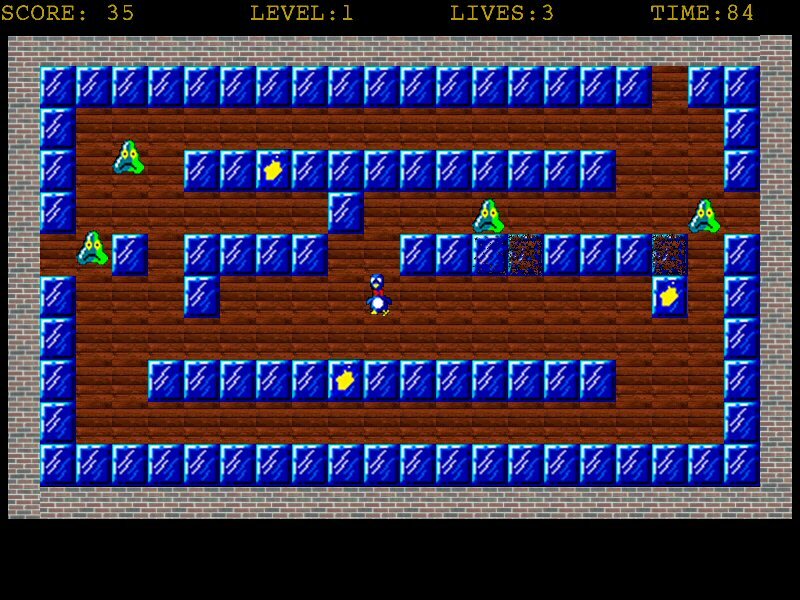 In this game, you control a penguin that has mutated beyond all expectations and now wears a snazzy red bow tie, and you must guide him around the screen, pushing ice blocks around to kill slug-like creatures called spods. If you want to try the game out to see what can be achieved with the Development Kit before splashing out, it is available as a free download from !Store. For reasons that should be obvious, though that version is crunched – while the version supplied with the kit comes with the source code fully readable, and serves as a working example of what can be done with the core, sound and tile libraries. You can also see how it plays by watching a video of the game in action on YouTube. 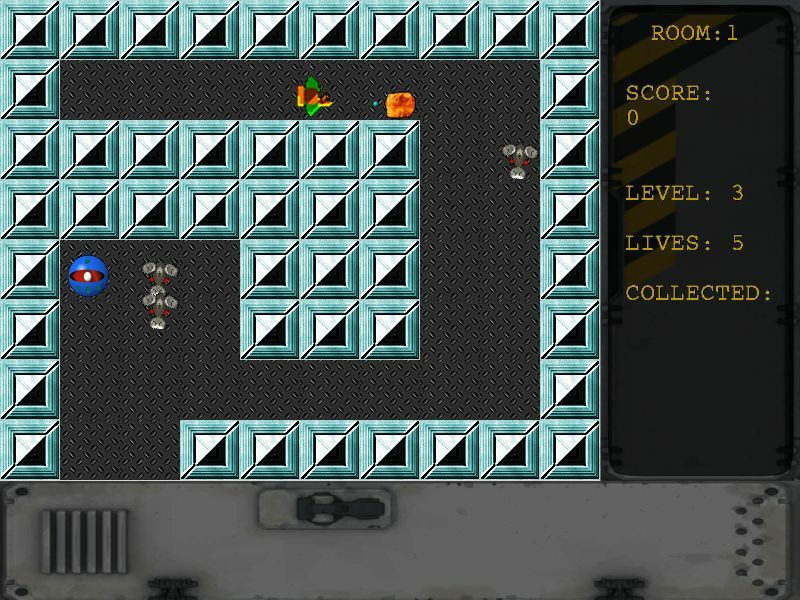 Taking on the role of a cyborg treasure hunter, your goal in this game is to find ancient treasure in Castle CyberDroid, all the while avoiding and destroying the security robots that are teleported into the rooms around your location – not to mention the holographic energy field, Buzz, that activates when you’ve been in a room for more than thirty seconds. Cyborg is also available separately, but since it’s a more complex game, with multiple screens per level and more game logic, this time it’s not free, and costs £9.99 from !Store – and there is a video of the game in play on YouTube. The core code for the game was written in less than two days as a way of ‘proving’ the library functions available with the kit. 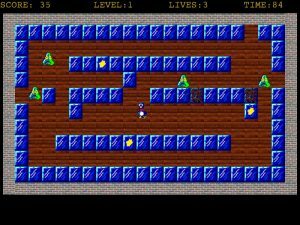 The third game supplied with the kit is Sparky, a much simpler game that was written in a very short space of time, and which resulted in a couple of new methods being added to the tile library. The name might suggest it’s a simulation of running a business as an electrician, but it’s not that at all, and is most easily described as a reverse-Pacman. 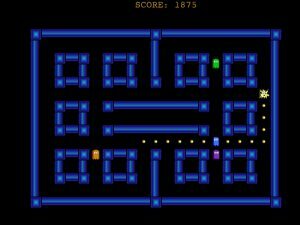 You control the title character – a living spark – and move around the screen avoiding the ghosts, and drop dots rather than collect them. 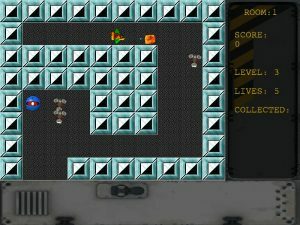 Sparky is currently only available as part of the kit, and is presented both as a playable game, and as a five phase case study in using the kit to develop a game. The AMCOG development kit is compatible with RISC OS 4 on VirtualRiscPC, and RISC OS 5 on Iyonix, Raspberry Pi (1-3), BeagleBoard and PandaBoard-based systems, ARMX6, and RPCEmu. It is available from !Store for £14.99, with updates for existing customers free of charge. If you’ve purchased it on CD at a show, there should be a code in the CD box that allows you to download the updated version from !Store.